James Sheehan, otherwise known around the club as "Big Jim" is this week's Toronto Dingos interview. The energetic ruckman injured his ankle some weeks back and is due to return within the next few rounds. Here's what he had to say. Former Dingo Mike Butcher was a great buddy of mine at UWO|Western University. He invited me out for a run once I returned from Australia to have a crack at some AFL. The rest is history. Rugby League on the Gold Coast, Australia. It's 360 degrees of chaos, challenging and exciting. It is clear to see the guys who have been playing the game their entire life and who is new. Great culture. Sometimes I feel like I'm back on the Gold Coast, even if its just for an hour or two a week. Lots of passion and teamwork within this group. What are your favourite things about being a Dingo? 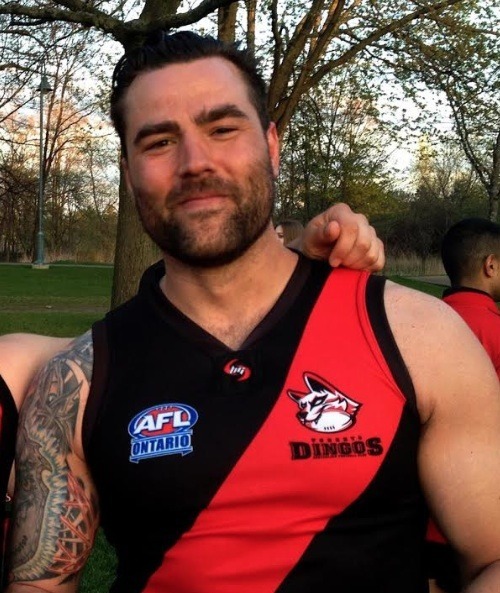 The passion and teamwork: There are alot of guys who absolutely love this game, both from an athletic standpoint but likely from a heritage standpoint also; what a great concept in bringing Aussie Rules to Canada and sharing the game. The first was dropping 30lbs to improve fitness and speed, now it is learning the strategies and techniques of the game to see how I can be valuable to the team. Winning a flag is always a given, but breaking down the skills and tasks so I can understand 'how' to be a contributor to the team is key. You are an accomplished musician with many projects on the go, what was the best gig you ever played? Amplitusion's Shred4Cancer was a SickKids fundraiser where I shaved my head midway through a show and donated it to LocksForLove, a company that makes wigs for children undergoing chemo. It raised around $10k and was a massive team effort with Halcyon Records. That was amazing. Music is my true passion. Mike Butcher and Craig Stewart- Amazing talent, a couple of classy gents who are leaders with great heart. We should have a fundraiser to Bring Back Butcher! Winning the Div2 Flag last year.